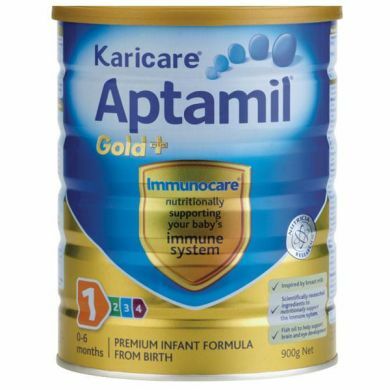 Nutricia Karicare Aptamil Gold Plus #1, for infants from birth. ** POSTAGE MAY BE MORE EXPENSIVE FOR THIS ITEM (due to weight and dimensions of parcel). 1. Sterilise bottles, teats and utensils by boiling or using an approved sterilising agent. 2. Boil water and allow to cool to approximate feeding temperature (37 degrees). 3. Measure the volume of cooled, boiled water into a sterilised feeding bottle. 4. Fill the scoop lightly and level with a knife, avoid compacting formula. Add the required number of level scoops of powder. 5. Always add one level scoop of powder for each 50ml of water in the feeding bottle. 6. Place the cap on the bottle and shake to dissolve the powder. Before feeding, check the feed is at the right temperature by shaking a few drops on your wrist. Karicare Gold Starter Formula is a whey based Infant Formula specially designed for bottle fed infants from birth when baby is not breastfed. Karicare Gold Starter Formula is especially formulated to provide LCPs Omega 3 and Omega 6 for babys growth and development. For infants over 6 months Karicare Gold Follow-On is designed to meet the needs of growing infants. Recent recommendations discourage the use of ordinary cows milk for babies under 12 months of age. Milk solids, Vegetable oils, Lactose, Maltodextrin, LCP oils (Arachidonic acid oil and Tuna oil), Soy lecithin, Minerals, Acidity regulator (Citric acid and/or Calcium hydroxide), Vitamins, (includes B-Carotene), Choline chloride, L-Carnitine, Taurine, Antioxidant (Sodium Ascorbate, Ascorbyl palmitate). Major Nutrients - Prepared Feed per 100ml. Follow instructions exactly. Prepare bottles and teats as directed. Do not change proportions of powder except on medical advice. Incorrect preparation can make your baby very ill. Infants over 6 months should be offered foods in addition to formula. Karicare Infant Formula 1 is based on whey dominant cows milk proteins. Use only the enclosed scoop (7.2g measuring scoop enclosed). Always add one level scoop of instantised powder to each 50ml of cooled, boiled water. Under or over dilution is dangerous. Note: 1 scoop of formula added to 50ml of water yields approximately 55.7ml of formula.